Last night’s 45th Parallel concert was entirely composed of works for the string sextet, an ensemble that often makes its appearance as the culmination of an evening’s program. Indeed, here was a concert composed of three pieces, each of which could have easily been the climax of a traditional chamber music festival concert. Like the string octet, there are a few outright masterpieces in the genre, and little else – it is something of an endangered species in the compositional world. That is why it was so gratifying to experience the US premiere of Peter Maxwell Davies’ work for string sextet, composed in 2009, The Last Island. At just over 12 minutes in length, it is a work that presents few challenges for a modern audience, indeed, at least night’s performance, the capacity audience at Portland’s Old Church seemed to be transfixed by the work throughout. It breaks little ground in terms of extended techniques for stringed instruments – this is not a work in the vein of 8 Songs for a Mad King – but where it succeeds brilliantly is in its evocation of the landscape of Davies’ beloved Orkney Islands, which are renowned for their bleak and forlorn beauty. Island emerges from silence in the form of harmonics punctuated by pizzicati, entirely ambiguous, with moments of clarity emerging slowly with intervalic fragments presented first in the cellos, then slowly climbing out of the darkness to the violas, and finally the violins. Over the course of the piece, these fragments coalesce into the plainsong version of the tune Ave Maris Stella (Hail, Star of the Sea), which is given its first full presentation by the first cello towards the final third of the work. The performance was assured and had moments of true brilliance and virtuosity. 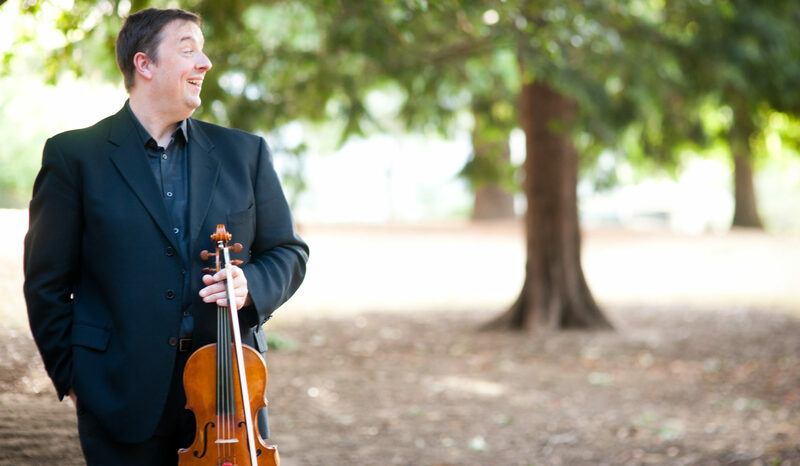 Particularly impressive were violist Jennifer Arnold, who handled the demands of the first viola part with little apparent discomfort, and violinist Gregory Ewer, who similarly seemed to have no technical limitations on his instrument. The ghost of Schoenberg hangs over the entirety of Island: arch form, one-movement, episodic structure, the free and expanded handling of tonality, and the overall darkness of the orchestration. This is not to say that it is derivative – it is quite original, and entirely in keeping with Peter Maxwell Davies’ (who turns 80 later this year) unique compositional voice, and supremely evocative of the time and place in which it was written. It is a welcome addition to the repertoire of the string sextet, and one hopes that it will find a home in repeated performances as a result. Whereas the Davies was one of the newest additions to the string sextet genre, the work which followed, Arnold Schoenberg’s Verklarte Nacht (Transfigured Night), is one of the most beloved sextets in the repertoire, in spite of the dreaded composer’s surname that is attached to it. This work does not embrace the atonality of Pierrot Lunaire or the complete serialization of the Variations for Orchestra, but rather a lush and utterly romantic sound that, as host Robert McBride noted in his introductory remarks “is a cross between Brahms and Wagner”. The piece was given a beautifully detailed performance, with the only lapses in ensemble occurring towards the end of the piece, when, no doubt, a bit of fatigue was setting in after the demands of the Davies for those players doing double duty. Sarah Kwak’s luminous tone soared over the ensemble. Her sound was never forced, always beautiful, and carefully balanced by the rest of the players – which is a difficult feat in a piece which is very densely written, and where the second parts can often overwhelm the more delicately written leading parts. Cellist Nancy Ives played with a lovely, flexible, and clearly projecting sound, which was brought to the fore to great effect at the great D major resolution of the piece – one of the great moments for the cello in the entirety of chamber music! And violist Jennifer Arnold was commanding in her performance of the first part, with similarly gorgeous tone and impeccable intonation and phrasing throughout. Second players Vali Phillips, Adam LaMotte, and Hamilton Cheifetz provided muscularity and delicacy as needed, always sensitive to the leading voices (or when they themselves were the leaders). After intermission, where the players earned themselves and entirely richly deserved moment of repose, came one of the chestnuts of the sextet repertoire, and perhaps the most often-performed of the works in this genre, Brahms’ B-flat major Sextet. This is a work that can often shout when it merely needs to speak firmly and with authority, and 45th Parallel succeeded brilliantly at making this distinction – the sound was never forced or harsh, and was full of both warmth and clarity – a rare combination, especially for this particular piece of music. Like the Schoenberg, Brahms gives primacy of place to the first players, leaving the second players largely as the supporting cast. Violist Adam LaMotte provided a bright and clear sound that allowed him to be heard throughout his many beautiful solo turns, especially at the beginning of the sublime slow movement. Cellist Hamilton Cheifetz was excellent throughout, handling the treacherous solo at the beginning of the finale with ease and grace. And Sarah Kwak was again, as in the Schoenberg, and elegant and steadfast leader, with her relaxed tone and confident demeanor providing just the right qualities necessary for a beautiful performance. It seems that 45th Parallel is hitting its stride with one strong concert after another. With the appointment of composer/violist Kenji Bunch as composer-in-residence beginning next season, it stands to reason that the ensemble with continue to be at the forefront of innovative programming, community engagement, and performances of the highest quality. Bravo!